Time for a phone system upgrade? Introducing Elevate, an easy-to-use cloud-based business phone system that helps employees to be more productive. Collaborate with a full-featured PBX, combined with audio, video, content sharing, conferencing, and file sharing capabilities. In the office or on the road, Elevate seamlessly integrates all your communication tools – desktop phones, mobile phones, and computers – into one manageable solution oriented around your employee’s needs and preferences. Elevate is a fully integrated unified communication and collaboration platform for small businesses that combines a PBX phone system, video conferencing, screen sharing and file management into a seamless experience. We Are Purpose built for reliability; east and west coast datacenters provide redundancy and minimize latency for your VoIP phone system. Our solution is immune to local failure. Stringent prequalification guidelines and proprietary VoIP network testing help ensure a reliable connection and crystal-clear voice quality. We will not deploy systems that will not perform in an optimal manner from the start. Our phone service scales to any sized business; order service according to the number of users or resources needed today, pay only for what is used. Ordering additional service cloud phone services is easy and can be deployed quickly. Collett Systems’ VoIP telephone service scales to a large number of users per business – up to 1,000. Enable Business continuity and Disaster Recovery; the Elevate mobile app has full business phone functionality to be used in the event that desk phones become unavailable. This cloud based system is immune to local outages. Elevate will try all user devices, then dial phone numbers like cell phones, hunt groups, or other auto attendants. You never need to miss a call again. Lower infrastructure and operating costs compared to traditional phone service with no additional hardware to buy. We even include phones in mosts cases. Specialty phones such as cordless, and conference room speaker phones are excluded. 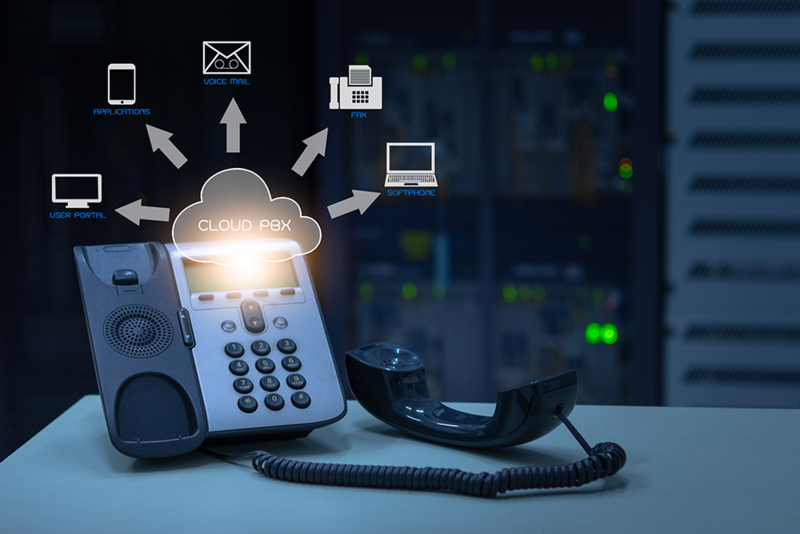 Consolidation of voice PBX and data onto one network reduces deployment expense further. Of course flat, per-user rates with unlimited domestic local & long distance calling are included. Increased productivity & collaboration; mobile devices interact seamlessly with the corporate phone system anywhere, anytime, and on any device, creating a more flexible workforce. Video conferencing and screen sharing empowers collaboration in real time while cloud file storage and sharing helps keep documents organized and secure.